In general, pacemakers are placed to treat heart rates that are too slow or when the atrial pacemaker (SA node) no longer communicates with the ventricular pacemaker (AV node). In some circumstances a pacemaker can be placed which can detect and treat certain types of fast heart rhythm problems. An artificial pacemaker is a small electronic device that has its own battery, and when connected to the heart muscle by a thin wire called a lead, can detect the heart beats. If the heart beat is too slow the pacemaker can send a signal to the heart to make it beat faster. The type of pacemaker needed is determined by the nature of the rhythm problem and the size of the child. In very small infants and toddlers the pacemaker may be placed in the upper abdomen and the wires may be attached to the heart muscle directly in surgery. In the older child, the wires (leads) are threaded through a large blood vessel without the need of surgery. The pacemaker is then usually placed near the left collar bone under the skin. Information about the make and model of the pacemaker will be given to the parents of the child having the pacemaker inserted. They will also receive cards for their records. The procedure or operation to insert the pacemaker is done either in the operating room with the child put to sleep in the case of a very small child, or in the electrophysiology laboratory with mild sedation if needed in the older child. The incision will be under the left collar bone or in the upper abdomen. 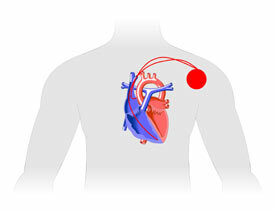 In the case of a permanent pacemaker, nothing will be visible outside the body. First the lead or leads are placed in contact with the heart muscle and they are tested to make sure that they will work well. Then the pacemaker is put in place and the whole thing is tested. Once everything is working well the skin incision is closed and the site is bandaged. Recovery from the anesthesia or sedative will take several hours and then the child may resume a regular diet.